Tropical Pork Shish Kabob's In Under 30-Minutes! — Welcome to Fitty Foodlicious! Sponsored post is written by me on behalf of Smithfield® Marinated Fresh Pork. The opinions and text are all my own. The days are warming up and the nights are lasting longer. Kids are spending more time outside and there is freshness in the air that only comes with summer. It's time to get outside as much as possible and spend time with family, friends, and loved ones. Cooking in the heat is the last thing on my mind and I want to be able to cook something fresh and easy for those hot summer nights. My husband has been working 7-days a week and I've been capturing tons of summer weddings and going to graduate school for nutrition. To say we are busy is an understatement! We love eating at home because we can cook up healthy, no fuss recipes and dinnertime is when we spend quality time together. No matter how busy we get, we always make sure to eat dinner together. I came up with a fun, quick, healthy, meal that's easy to make any summer night of the week! I went to Safeway and picked up some Smithfield Marinated Fresh Pork in the fresh meat section. I love Smithfield Marinated Fresh Pork because it delivers real flavor real fast! It also doesn't have any artificial ingredients, which is really important to us. The great thing about Smithfield Marinated Fresh Pork is it comes in many different flavors, such as Hardwood Smoked Bacon, Steakhouse Mushroom, Applewood Bacon, and Roasted Garlic and Herb to name a few! But when I saw that Safeway had Smithfield Marinated Fresh Roasted Garlic and Herb Pork Loin Filet, I knew I had to have it! Garlic is my jam and I basically put it on everything. I love that Smithfield Pork is slow marinated and seasoned, so the prep work is done for you, making this the easy summer dinner option. Smithfield Marinated Fresh Pork also comes in a variety of fresh cuts, which works for all kinds of yummy dinner options. The best part about Smithfield Marinated Fresh Pork is you can roast, sauté, grill or slow-cook it for an easy and delicious meal in under thirty minutes! I've been craving shish kabobs lately and they are super easy to make! The Roasted Garlic and Herb Pork Loin Filet delivers real flavor, real fast and is perfect for making shish kabobs! In less than thirty minutes, you will have a meal that works for dinner, lunch, and maybe even breakfast if you're up for it. 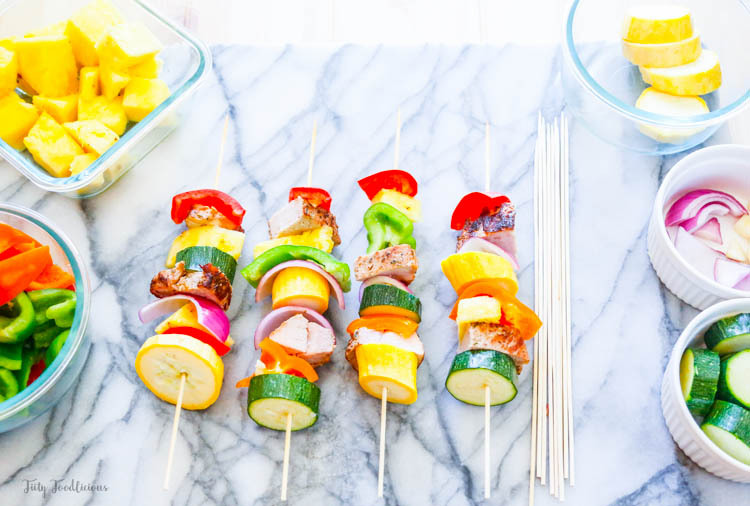 For these tropical pork shish kabobs I used a colorful variety of fresh fruit and veggies! Step 1: Preheat oven to 350-degrees. I really wanted a smoky flavor to my Tropical Pork Shish Kabobs so I seared the pork loin filet in a cast iron skillet for 3-minutes on each side and browned it. You don't need to sear the meat for too long! Doing so will overcook it, just sear it for a few minutes on each side to get it nice and crispy and to add an extra smoky flavor to it. Step 2: Place the pork loin filet in a roasting pan in the oven for 20-minutes. Set the timer and while the pork loin filet is roasting, prep your shish kabobs! Check out the full recipe on YouTube below! Step 4: After 20-minutes, remove the pork loin filet from the oven and slice. It should be slightly pink in the middle. Step 5: Now you’re ready to make Tropical Pork Shish Kabobs! Place each item on the bamboo skewer in the order you prefer, but remember to have a good meat to veggie ratio. Next, wrap the shish kabobs in tinfoil and place in oven for 5-minutes on broil. Step 6: Remove the shish kabobs from the oven and enjoy! They should be crispy on the outside but tender on the inside. Enjoy this delicious meal any day of the week and let me know if you guys make them! What would you add to your shish kabobs? What's your favorite summer activity? What's your favorite way to eat pork?